A girl has fallen ill in Salem and witchcraft is suspected. When a group of young girls led by Abigail Williams (Andrea Wenzl) starts to act possessed, things quickly run out of control and one woman after the other is accused of being a witch, apprehended and put on trial. But Abigail has her own motives and they revolve around John Proctor (Steven Scharf) who had a short-lived affair with her some time ago. John doesn’t realize the gravity of the situation at first, but as things continue to spiral out of control he finds himself more and more involved. This production of Hexenjagd did not work for me at all. In fact, we left during the break because we just couldn’t take it anymore. Maybe that’s because I saw another production not that long ago, but I think it has more to do with the fact that the play opens with a group masturbation scene to show the “witching” the women in the play do. I felt this was unnecessary in very many ways, but mostly because it was voyeuristically sensationalizing female sexuality. The best thing about the play was the stage design that was stark and bold, but it did get a little monotone with time. With that last appeal lost, I didn’t regret leaving early at all. After Agamemnon (Maria Happel) returns home from war with Kassandra (Andrea Wenzl) as his trophy, his wife Klytameistra (Caroline Peters), who is living with Aigisthos (Barbara Petritsch), kills Agamemnon and Kassandra both, to avenge Agamemnon’s killing of Iphigenie, their daughter, a continuation of the family curse that weighs on Agamemnon due to his father and uncle sacrificing their own children to the gods. Agamemnon and Klytameistra’s son Orestes (Aenne Schwarz) vows to revenge the murder of his father too, continuing the spiral of blood and violence. 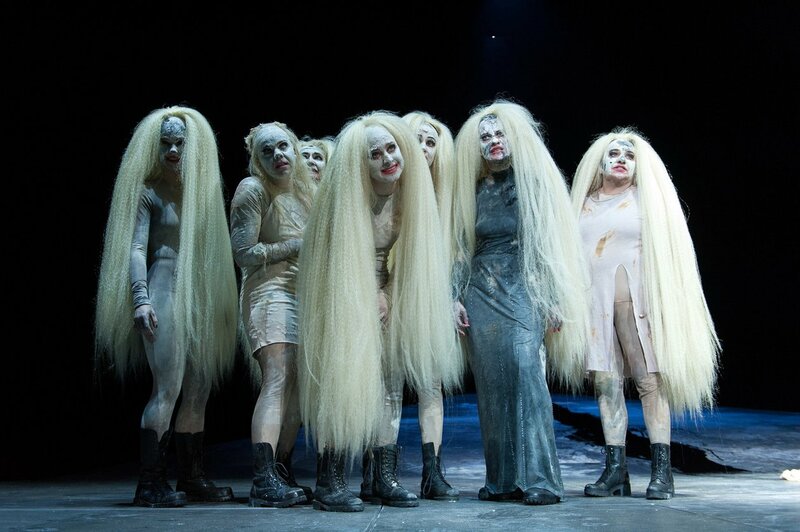 The production of the Oresteia walks the line between traditional setting and modern sensibilities. Ultimately it is visually striking and well-acted, but maybe a little too conservative. Beatrice (Andrea Wenzl) has problems: her fiancé Florindo (Sebastian Wendelin) had to flee after killing her brother Federigo. Now she’s trying to find Florindo and on the way, collect dowry from her brother’s fiancée Clarice (Irina Sulaver), or rather her father Pantalone (Peter Simonischek). But she’ll only succeed by convincing them that Federigo is not actually dead – so she travels disguised as him. Traveling with her is her servant Truffaldino (Markus Meyer). Truffaldino is unhappy with his pay and always hungry. So when they stop at a hotel where another guest offers Truffaldino a job as servant, he accepts – unaware that it’s Florindo. But having to serve two masters at the same time is more complicated than Truffaldino expected. 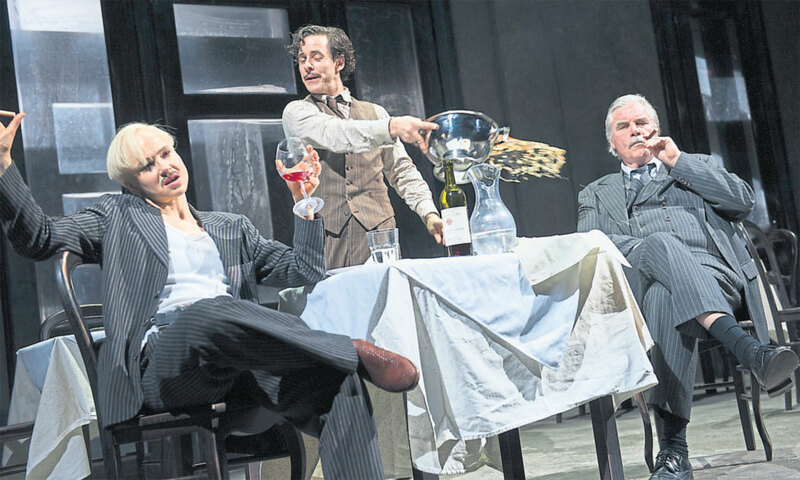 I’m not a huge fan of comedies of error in general, but this rendition of Servant of Two Masters was rather enjoyable and funny, even if it didn’t leave me flat out enthusiastic. 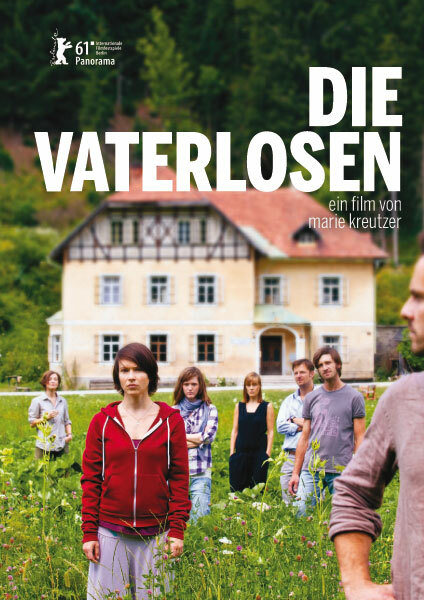 Die Vaterlosen is the first film by Marie Kreutzer, starring Andrea Wenzl, Philipp Hochmair, Andreas Kiendl, Emily Cox and Johannes Krisch. When their father Hans (Johannes Krisch) dies, the children come together in the house they grew up in, where Hans had built a commune together with friends. Even Kyra (Andrea Wenzl) shows up, who was out of touch for the past twenty years. As Kyra re-connects with Niki (Philipp Hochmair) and Vito (Andreas Kiendl) and meets her little sister Mizzi (Emily Cox) for the first time, old tensions mostly with Hans are dragged up from the past and start to escalate. For a debut film, Die Vaterlosen isn’t bad. The movie starts off strong, the characters are well drawn and the cast is mostly very good. But in the end, there’s a lot of untapped potential and the plot just doesn’t work that well.